By the time you’re screening candidates, you’ve invested a lot of time and money. You don’t want a bad background check experience to derail the deal. 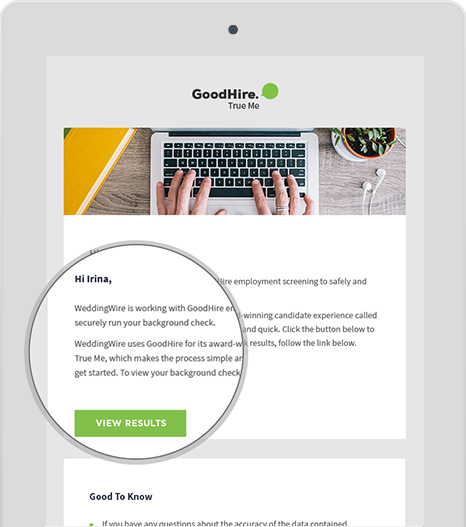 GoodHire’s award-winning candidate experience gives you the peace of mind you need to know you'll meet your hiring deadlines and close the candidates you want. 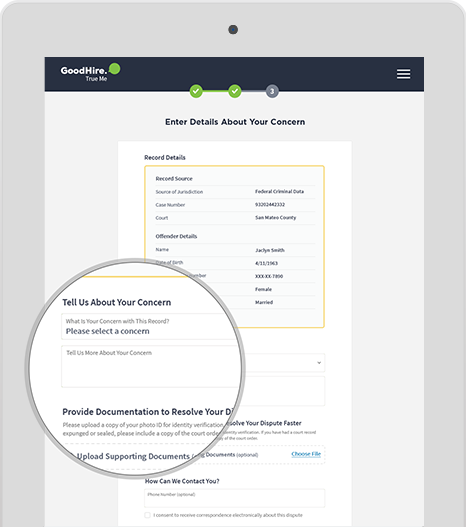 Candidates can enter information and digitally sign consent forms on any device they choose. We let candidates know if we need more information and when their results are ready. Candidates can access their results in the same simple, interactive online format available to you. Candidates who have criminal records can add context to help you with individualized assessment and fair hiring. 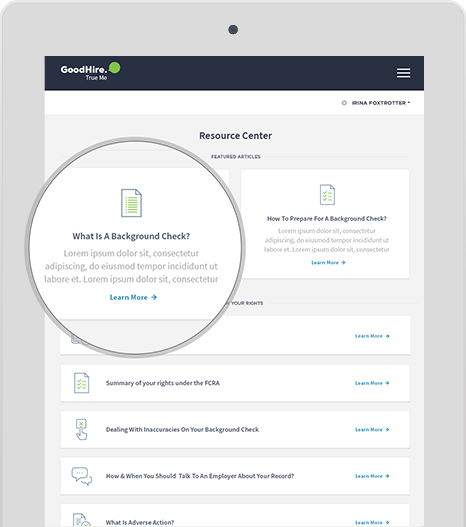 Our online resource center and US-based support experts answer questions and put candidates at ease. If candidates spot inaccuracies, they can easily file a dispute online. We’ll notify you both of any updates. High-profile fair-hiring stories, increasing EEOC oversight, and employment screening lawsuits make compliance seem daunting. 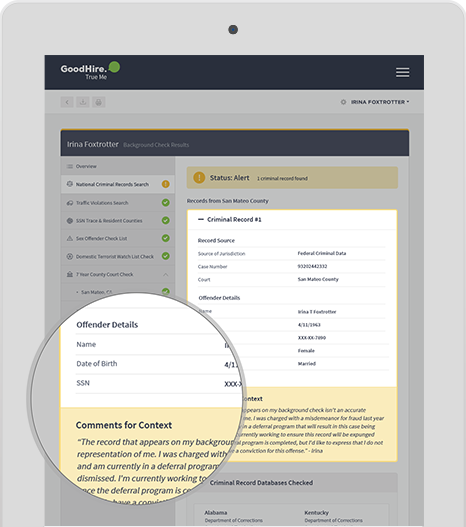 GoodHire’s in-house compliance experts keep an eye on regulatory changes to make sure consent, adverse action, and disputes – common lawsuit triggers – are handled according to federal and state regulations. The end result? Protecting your business and ensuring candidates get a fair shot. You should never have to hear that a negative background check experience changed a top candidate’s mind. GoodHire’s friendly, knowledgeable US-based support team consistently earns high praise in independent reviews. Our experienced staff answers all your questions and provides the exceptional service you and your candidates deserve. At some point, you’ll likely meet a great candidate who also has a criminal record – nearly 1 in 3 adults have one. 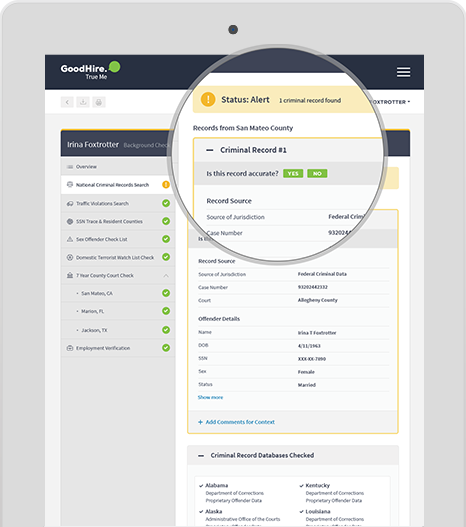 GoodHire helps you see the person behind the record by allowing candidates to write fact-based, insights-focused context directly in their background check results. The context they provide gives you a clearer picture of what happened and what steps have been taken since the offense. Our experienced sales team is ready to talk anytime. 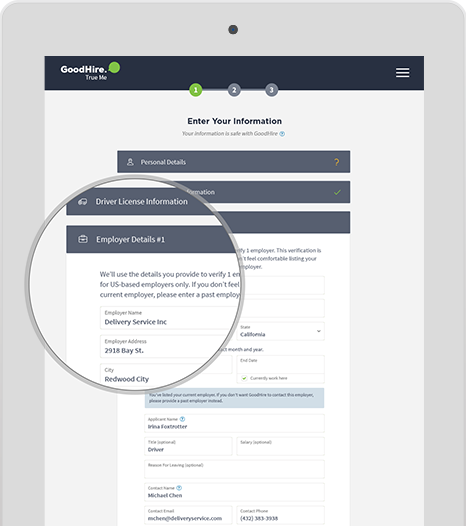 If you’d like to explore the candidate experience for yourself, why not run your own personal background check?